The question thus becomes, what actors really matter in the governance of the Amazon and indigenous lands. Even if the President is constricted by his government or international laws, is his speech and support of local actors enough to make the invasion and exploitation of indigenous lands a normality. This should by no means erase the years of invasions and exploitation that indigenous peoples in Brazil have experienced nor gloss over the previous governments who have cut back funding on indigenous development projects and given companies unregulated access to their lands (NY Times, 2018). Nevertheless, it is important to think about how the identity expression, objectives, and manifestations of struggle on behalf of indigenous peoples will adapt to the President- elect, and his explosive rhetoric. Throughout Latin America indigenous peoples have been confronted with governments and companies that do not recognize their claims to the land. Indigenous peoples have employed an array of agendas and activism to have their rights to social, economic, and political inclusion recognized which usually culminates in their struggles for self-governance of land. Like many other indigenous groups whose existence has been threatened by resource extraction, indigenous groups in Brazil will decide what modality of resistance and self-protection works best given the political and social climates of today. In their book Ethnicity Inc., Comaroff and Comaroff argue that the political nature of identity is essential especially considering the “ tendency of [neoliberal capitalism] to short-circuit deliberative and distributive politics—contestation, that is, over ideological principle and the public good, over social values and ethics, over the means and ends of governance—in the name of economic efficiency, capital growth, the workings of the “free” market…” Given that Bolsonaro plans to increase resource extraction on native lands in efforts to spur economic growth, he has further politicized indigeneity and indigenous actions. As examples from all over the world have shown, indigeneity has a strong precedence of wielding political power, and given the significance of the Amazon in controlling climate patterns in places as far away as California the international interest in the preservation of the Amazon may become a vehicle for indigenous peoples to create a platform for their preservation. Comaroff, John L., and Jean Comaroff. Ethnicity, Inc. Univ. of Chicago Press, 2010. LondoÑo, Ernesto. 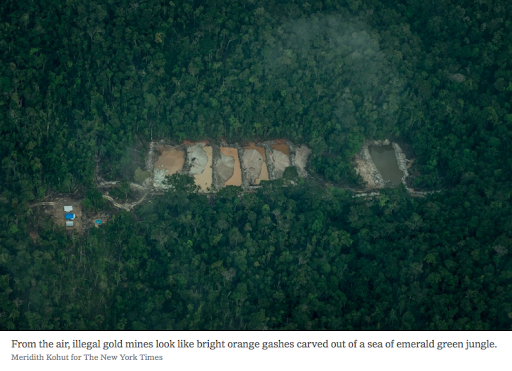 “As Brazil’s Far Right Leader Threatens the Amazon, One Tribe Pushes Back.” The New York Times, The New York Times, 10 Nov. 2018, www.nytimes.com/2018/11/10/world/americas/brazil-indigenous-mining-bolsonaro.html. Pimentel, Mauro. “How Amazon Forest Loss May Affect Water-and Climate-Far Away.” National Geographic, National Geographic, 19 Nov. 2018, www.nationalgeographic.com/environment/2018/11/how-cutting-the-amazon-forest-could-affect-weather/. Wallace, Scott. “Brazil’s New Leader Promised to Exploit the Amazon-but Can He?” National Geographic, National Geographic, 31 Oct. 2018, www.nationalgeographic.com/environment/2018/10/brazil-president-jair-bolsonaro-promises-exploit-amazon-rain-forest/.